This weeks post is kinda of ironic considering I am currently in warmer climates.......not trying to make you jealous, promise;). Autumn/Winter is actually my favourite seasons for fashion, I love my chunky knits, scarves, boots and there is always that one staple item that makes a come back each year and might I add a great transitional piece between seasons which of course you have already guessed by now from the title of this post, is the fabulous Fur Gilet! I have owned a couple of Gilets in my fashion time, but at the moment living where I am It does not make any sense at all to have one. So I am currently living my Autumn/Winter fashion dreams through online browsing and thought it would be fun to create 3 Fashion looks all inspired by the Fur Gilet. I chose to use all items from H&M for this post as to be totally honest this has been my go to store for many years and has not failed me yet. 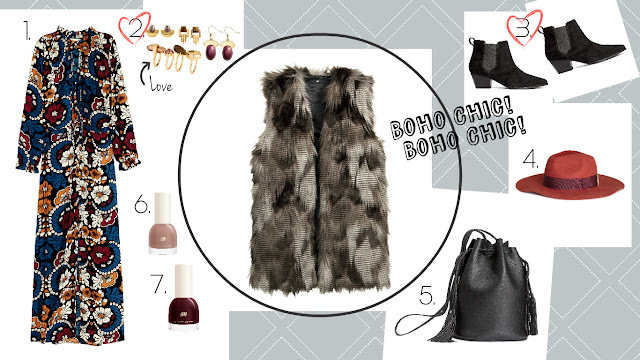 Boho Chic meets Chelsea girl has been a popular look for some time now and one that I am always drawn to for the easy breeziness of it. A stand out piece from this collage has to be the long chiffon print dress, which on it's own I would not normally go for but I think it works really well with this whole look and adds some fun to it. I am crazy for this jewellery set in this collage and absolutely love each item which is hard to believe as I am someone who has always preferred to buy individual items as opposed to sets of things, but somehow this season H&M seemed to have got it spot on. Finally to top of this whole look you have to add a fedora style hat which seems to be a wardrobe staple for most. Not only does it keep within the boho theme there is also a practical use for it by keeping your head warm on those cold fresh days. I chose this particular colour as it brings out the orange and red in the dress. If you wanted the look to be a little more understated you could swap the brightly colour hat for more of a taupe/mink colour that would work just as well with this outfit. 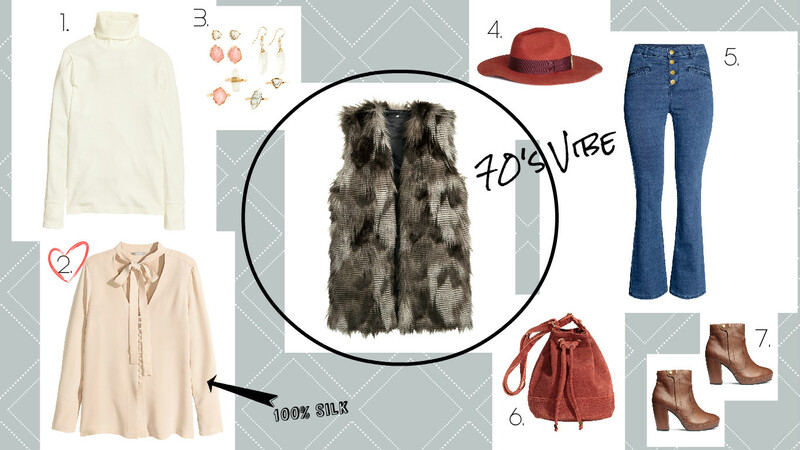 Going with the 70's theme in this collage and again keeping it real simple, just how I like it. I am definitely a girl who lives in her jeans and am so happy to see high wasted flared jeans back in the shops. I do find this style of jean to be flattering on women that are more on the curvy side and wearing it with some heels gives the illusion of having those dreamy long legs like Naomi Campbell...well not quite, but you know what I mean. I have combined 2 different style tops in the mix, one being a basic polo neck top and the other being a blouse with a ribbon tie neck thing going on which I would gravitate more to than the other, being that it is loose, floaty and where the fabric is breathable I can easily get wear out of it in the spring/summer months too. I added a pop of colour with the accessories to break up the neutral tones and can not get over this gorgeous burnt red which I personally believe looks good on all skin tones and is the perfect autumnal colour. My final collage and one that is probably the closest to my personal style at this moment. There is without a doubt 2 staple items in this collage, the first being a crisp white cotton shirt which you can find everywhere at the moment, so so so effortless to wear and one that can easily be layered, dressed up or down depending on the occasion. Everyone needs a white shirt in their wardrobe...it as a fashion must! The second item is of course a black pair of ripped jeans....what can I say on this...I am sure by now that near enough every girl owns a pair of ripped jeans. As I have based this look on a City Girl, I decided to go with a large size leather bag to carry our life in and topping off the look with a purple colour bold lip and Voila! Hopefully you have not fallen asleep from reading this long post and somehow found some of it useful! Would love to hear from you on what your favourite look or item is from this post? 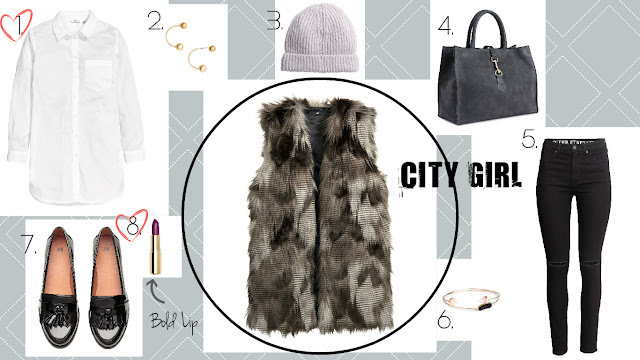 Have you bought a Fur Gilet this season and if so how do you style yours?